There were no giant zombie battles. There was no mustache-twirling villainy. (Well, almost none.) And there was a distinct lack of endless conversations about the meaning of life. Instead, what the ninth season premiere of The Walking Dead gave us was a new society, new tensions, and a promising start. It’s hard to fault the many viewers who dropped away from the show in the past two seasons. 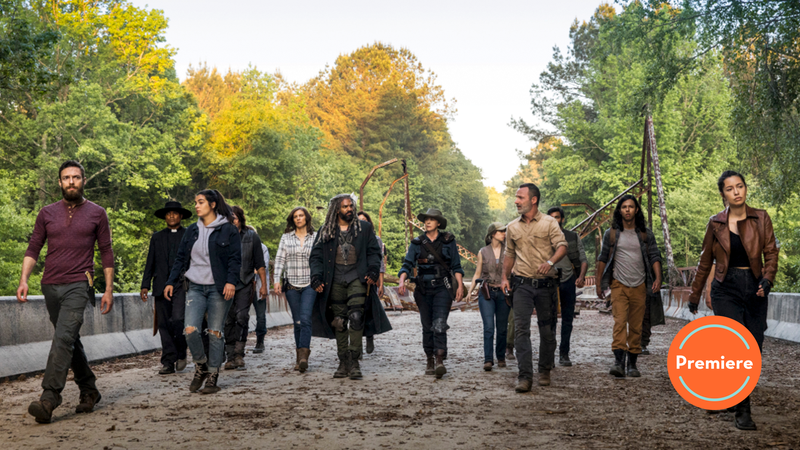 The joyless exercise in miserabilism that was the first half of season seven made it hard to invest in the struggle against Negan and the Saviors, no matter how compelling the new supporting characters were. (R.I.P. Simon.) And while last year’s non-stop war provided more than a few awesome moments, it also continued to ramp up the cartoonish plot twists and over-the-top hamminess to the point that anyone watching needed to either abandon hopes for serious drama and roll with the silly, or find themselves stuck hate-watching a show they no longer recognized or enjoyed. (If that was you, then dear god, I feel for you, but also: Why?) If nothing else, the latest season is kicking off with a time jump and a soft reset as our characters build a new society, but find the tensions of the past haunting the present. And in a welcome change for this series, that narrative frisson offers some intriguing possibilities. From the moment the group passed the Washington monument and the new credits started rolling (a much-appreciated change-up), it was clear the series wanted to turn the page and start a fresh chapter. Even with the direct references to Negan rotting in a cell back in Alexandria, this was a very forward-looking start to the season: All the communities are relatively peaceful, trying to generate power, grow crops, and work together—even among rumblings of discontent from those who don’t like the sharing economy. Hell, they’re even establishing a new geographical map, as witnessed by the labeling of routes and bridges between the different regions. For the past two years, the enemy was always outside the walls, threatening to break in and destroy everything. That threat is now gone. Unfortunately, the looming concern is much more insidious. How long can this tentative peace hold? According to Daryl, it’s already falling apart. The failure to grow crops at the Sanctuary means those people are dependent on the generosity of others, a generosity that’s at an end, at least where Maggie and Hilltop are concerned. The suggestions for what to do with their former foes range from forced appropriation of their fuel to simply cutting the Saviors lose and letting them fend for themselves. It doesn’t help that resistance is still fomenting below the surface—that “we are still Negan” graffiti is reportedly a growing problem. And with Maggie’s own constituency at Hilltop whispering about her failures in leadership, shoring up stability is a primary concern. All it would take, the implication seems to be, is one bad day to spark a genuine fracture between our protagonists. That’s a state of affairs a long time coming. From last season’s fight between Rick and Daryl to the suspicions sowed among the different communities, the show has been planting the seeds of this politically minded intrigue for awhile, so finally putting Negan in the rearview mirror and addressing these concerns means the show is more grounded than it has been in a long time. It may be a new order that requires a new charter, as Michonne insists (not a constitution, let’s be clear), but if anything, it takes the show back to the early days of Alexandria, when the primary fears were the people alongside you, not the walkers outside the wall. New showrunner Angela Kang has been with the writing staff since the second season, and has a good feel for these characters and what they’ve already gone through. Not only that, but the renewed creative attention on interpersonal dynamics means some actors who mostly spent the last two seasons as cardboard cutouts of people are back in the spotlight in more complicated ways. The new romance between Carol and Ezekiel is a bit strange, despite Carol’s explanations (“After what I went through with Ed, corny is really really nice”), but the better chemistry is still the friendship between her and Daryl, who get a wonderful exchange that ends with her snuggling up into his shoulder. Likewise, the tense push-and-pull between Rick and both Daryl and Maggie offer promising hints of their growing estrangement, as both have clear personal reasons to pull away from their former leader. True, we don’t really check in with anyone else all that much—Eugene and Michonne get a few lines, as do Jesus and Aaron, but that’s about it for people we have any interest in (sorry, Earl and Tammy)—but there’s nothing wrong with the series remembering that a core group of characters displaying actual complexity is far preferable to a huge crew of one-dimensional simpletons sharing the screen. “When we were fighting the Saviors, you told me that soon you’d be the one following me. But you didn’t, because I wasn’t someone to follow. That changes now.” Maggie’s frank assessment of the Hilltop situation in the wake of Gregory’s attempt on her life pulls Rick up short, as it should. The botched murder scene was well executed—and better still, led to two unexpected moments: Gregory having the temerity to try and knife Maggie, and Maggie having the scheming ex-leader of Hilltop hung for his crime. That’s a smart move for the season opener, demonstrating her evolution as a character and shaking up the show’s former strategies of when to off people. (Killing off a nobody like Ken and trying to have it mean something is exactly the kind of weak example of how the show would’ve previously mined pathos, so kudos for having his death be little more than an incitement to far more interesting violence.) And honestly, part of the fun in seeing these changes in both Rick and Maggie stems from the knowledge that Andrew Lincoln (and possibly Lauren Cohan, who is only signed on for a limited number of episodes this year) is leaving the show, meaning this could actually lead somewhere unexpected—which is a rare treat and a creative shot in the arm for The Walking Dead. But it wasn’t just the characters that felt rejuvenated in this premiere. The opening setpiece was terrifically fun, as we watched our heroes try and maneuver an ancient wagon across a glass floor, part of their “actually, this makes sense, well done, show!” plan to grab seeds, agricultural ironworks, and more tools for their fledgling society. And the museum raid and washed-out bridge also worked to provide more of a sense of spatial geography than we’ve had in quite some time, though I still wouldn’t mind if someone just tacked a map to the wall at some point showing where all the communities were in relation to one another, even if the proximity to Washington, D.C. remains unknown for practical purposes. It was a whole lot of table-setting, but it didn’t feel as exhausting or unnecessary as in similar episodes from the recent past. 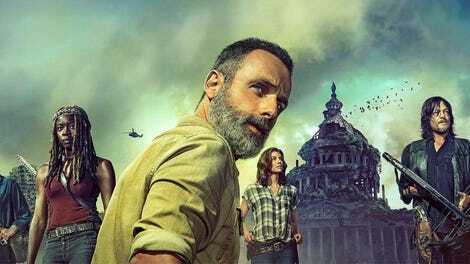 My fingers are crossed for a creative rebirth this year: With the Sanctuary threatening to erupt in violence, Hilltop already in the throes of it, and an uneasy coalition of allies regarding one another with suspicion, The Walking Dead is actually showing real signs of life. It only lasted a moment, but the spiders crawling out of the walker towards Siddiq was effectively creepy. Gregory was so often ridiculous, it was nice to see how he could actually come across as a thoughtful and charismatic leader—even if it was almost immediately ruined by turning him back into a conniving little twerp stupid enough to think he could gut Maggie in a direct attack. R.I.P., Gregory. Maggie’s eternal pregnancy finally comes to an end. Hello, baby Herschel. 20 bucks says Daryl and that arrogant Savior who didn’t want to clean the graffiti come to blows within the next five episodes. So much for that giant horde of walkers teased in the kicker to season eight’s finale. Welcome, everyone, to the reviews for the ninth (!) season of The Walking Dead. I’m looking forward to discussing it with you, especially now that the reign of Negan is over and the series is trying some new things. My colleague Laura Bogart will be filling in next week as I attend to some family matters, but I’ll be back soon to continue warning Carol against taking that ring from Ezekiel—seriously, why not just look to the skies and yell, “I dare you to try something, God!” while you’re at it, you two.